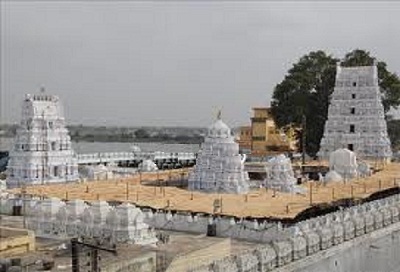 A popular abode of Lord Shiva in Andhrapradesh. Legend is that King Narendra, the grandson of Arjuna of Mahabharata consecrated the temple. The story goes like this; Narendra accidently killed a sage. Before dying, the sage cursed Narendra to get afflicted by leprosy. So, in order to cure his leprosy, Narendra wandered about and finally reached this place. On having a bathe in a lake called Dharmakundam (present day temple tank) he was relieved of his disease. Lord Shiva thereafter came to him on his dreams. The Lord directed to find a Shiva linga on the bed of the lake and get it consecrated on the banks of the temple. A joyous Narendra did so. This is the origin of the present temple. This temple is also known as �Hari Hara Kshetram� as it has shrines to Sree Seetharama Chandra Swamy (Lord Vishnu) temple along with the Lord Shiva temple. A Darga of Muslims is also there within the complex. This is another peculiarity. Historically, the temple is believed to have built by Sri. Narasimhan of Vemulavada Chalukya dynasty. He ruled the area in the 10th century AD. Vemulavada is about 150 kilometers from Hyderabad.